Dufour's gland (also called alkaline gland) occurs only in females (queens and workers) and it is absent in drones. It is an unpaired and unbranched epithelial sac. The glandular epithelium consists of a single layer of epithelial cells, which luminal surface is covered by cuticle. At the surface of the gland there are muscles  which can be used to discharge the gland's secretion. The gland opens into the dorsal vaginal wall . For details of ultrastructure see . 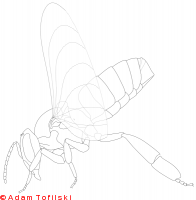 Size of the Dufour's gland differs between queens and workers . In queens its diameter is 0.27 mm and its length ranges from 2.45 to 2.77 mm . The gland length increases after start of egg lying by the queen . In workers the gland diameter ranges from 0.13 to 0.17 mm and the gland length ranges from 0.83 to 1.06 mm  see also . The gland is larger in laying workers and foragers . In workers of A. m. capensis the gland is particularly large . Secretion of the Dufour's gland contains hydrocarbons and esters . Queens produce much more of the secretion than workers and laying workers produce more of the secretion than workers without developed ovaries . In workers there is a positive correlation between development of ovaries and both amount of the secretion  and proportion of esters to hydrocarbons . In hopelessly queenless colonies workers producing more esters are more often attacked by other workers . Also composition of the secretion differs between queen and workers . The secretion of queens and laying workers contains both esters and hydrocarbons but secretion of non reproducing workers contains only hydrocarbons . In comparison to wild type laying workers laying workers of anarchistic bees produce particularly large amount of esters . Besides non reproducing workers differ from queens and reproducing workers in presence of eicosenol which is probably produced by the Dufour's gland . The hydrocarbons present in the secretion produced by queens were also found in tergal glands  and cuticular substances . Composition of the secretion can change after insemination  or onset of oviposition by the queen . The secretion of laying workers can inhibit ovary development in other workers . The secretion produced in vitro can differ from that produced in vivo . The secretion is present on worker layed eggs , queen layed eggs, walls of genital chamber and on the tip of queens' abdomen . The Dufour's gland secretion is attractive to workers and can be responsible for retinue formation around queens  and laying workers . The secretion of queens is more attractive to workers than the secretion of laying workers . Ester and not hydrocarbons are responsible for the attractiveness . The secretion produced by non-laying workers does not contain esters, therefore, it is not attractive to other workers . It has been suggested that the secretion contains an egg marking pheromone which allows discrimination between queens' and workers' eggs , however this was not confirmed . It has been also suggested that the secretion can be used by some laying workers to evade egg removal  but see . In older publications it was suggested that the secretion provides protective coating for eggs, it is used as an adhesive with which eggs are attached to the bottom of the comb cell  or that it is a sting lubricant . Those suggestions were not verified. Dufour's gland is homologous with colleterial glands of other insects. During development it is formed as invagination of the ninth sternum  p.20. The gland occurs in most Apocrita but its secretion and function differs between species. In species other than honey bee it can produce building material, larval food or pheromones . Trojan E. (1930) Die dufoursche Drüse bei Apis mellifica. Zeitschrift für Morphologie und Ökologie der Tiere 19:678-685. Abdalla F.C., da Cruz-Landim C. (2001) Size differences in the Dufour gland of Apis mellifera Linnaeus (Hymenoptera, Apidae) between and within the female castes. Revista Brasileira de Zoologia 18:119–123. Ikenga J.O., Chapman G.B. (1989) Ultrastructural Aspects of Dufour's Gland of Three Day Old Worker Honey Bees, Apis mellifera ligustica (Hymenoptera: Apidae). Journal of the Kansas Entomological Society 62:449–461. Kerr W.E., Lello E. (1962) Sting glands in stingless bees-a vestigial character. Journal of the New York Entomological Society 70:190-214. Lello E. (1976) Adnexal glands of the sting apparatus in bees: anatomy and histology, V (Hymenoptera: Apidae). Journal of the Kansas Entomological Society 49:85–99. Martin S.J., Dils V., Billen J. 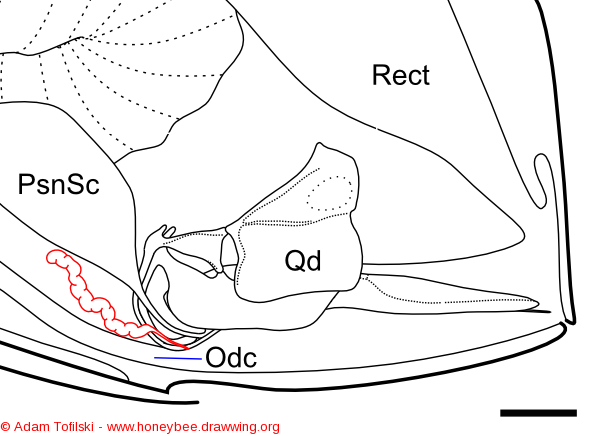 (2005) Morphology of the Dufour gland within the honey bee sting gland complex. Apidologie 36:543–546. Katzav-Gozansky T., Soroker V., Hefetz A., Cojocaru M., Erdmann D.H., Francke W. (1997) Plasticity of caste-specific Dufour’s gland secretion in the honey bee (Apis mellifera L.). Naturwissenschaften 84:238–241. Sole C.L., Kryger P., Hefetz A., Katzav-Gozansky T., Crewe R.M. (2002) Mimicry of queen Dufour's gland secretions by workers of Apis mellifera scutellata and A. m. capensis. Naturwissenschaften 89:561–564. Dor R., Katzav-Gozansky T., Hefetz A. (2005) Dufour’s gland pheromone as a reliable fertility signal among honeybee (Apis mellifera) workers. Behavioral Ecology and Sociobiology 58:270–276. Katzav-Gozansky T., Boulay R., Soroker V., Hefetz A. (2004) Queen–signal modulation of worker pheromonal composition in honeybees. Proceedings of the Royal Society of London. Series B: Biological Sciences 271:2065. Malka O., Shnieor S., Katzav-Gozansky T., Hefetz A. (2008) Aggressive reproductive competition among hopelessly queenless honeybee workers triggered by pheromone signaling. Naturwissenschaften 95:553–559. Martin S.J., Jones G.R. (2004) Conservation of Bio synthetic pheromone pathways in honeybees Apis. Naturwissenschaften 91:232–236. Martin S.J., Châline N., Oldroyd B.P., Jones G.R., Ratnieks F.L.W. (2004) Egg marking pheromones of anarchistic worker honeybees (Apis mellifera). Behavioral Ecology 15:839-844. Espelie K.E., Butz V.M., Dietz A. (1990) Decyl decanoate: a major component of the tergite glands of honeybee queens (Apis mellifera L.). Journal of Apicultural Research 29:15–19. Francis B.R., Blanton W.E., Littlefield J.L., Nunamaker R.A. (1989) Hydrocarbons of the cuticle and hemolymph of the adult honey bee (Hymenoptera: Apidae). Annals of the Entomological Society of America 82:486–494. Niño E.L., Malka O., Hefetz A., Tarpy D.R., Grozinger C.M. (2013) Chemical Profiles of Two Pheromone Glands Are Differentially Regulated by Distinct Mating Factors in Honey Bee Queens (Apis mellifera L.). PLOS ONE 8:e78637. Katzav-Gozansky T., Soroker V., Hefetz A. (1997) The biosynthesis of Dufour’s gland constituents in queens of the honeybee (Apis mellifera). Invertebrate Neuroscience 3:239-243. Richard F.J., Schal C., Tarpy D.R., Grozinger C.M. (2011) Effects of Instrumental Insemination and Insemination Quantity on Dufour’s Gland Chemical Profiles and Vitellogenin Expression in Honey Bee Queens (Apis mellifera). Journal of Chemical Ecology 37:1027–1036. Katzav-Gozansky T., Soroker V., Hefetz A. (2000) Plasticity in caste-related exocrine secretion biosynthesis in the honey bee (Apis mellifera). Journal of Insect Physiology 46:993–998. Katzav-Gozansky T., Hefetz A., Soroker V. (2007) Brain modulation of Dufour’s gland ester biosynthesis in vitro in the honeybee (Apis mellifera). Naturwissenschaften 94:407–411. Katzav-Gozansky T., Soroker V., Ibarra F., Francke W., Hefetz A. (2001) Dufour's gland secretion of the queen honeybee (Apis mellifera): an egg discriminator pheromone or a queen signal? Behavioral Ecology and Sociobiology 51:76–86. Keeling C.I., Slessor K.N., Higo H.A., Winston M.L. (2003) New components of the honey bee (Apis mellifera L.) queen retinue pheromone. Proceedings of the National Academy of Sciences of the United States of America 100:4486-4491. Katzav-Gozansky T., Soroker V., Francke W., Hefetz A. (2003) Honeybee egg-laying workers mimic a queen signal. Insectes Sociaux 50:20–23. Ratnieks F.L.W. (1995) Evidence for a queen-produced egg-marking pheromone and its use in worker policing in the honey bee. Journal of Apicultural Research 34:31-37. Martin S.J., Jones G.R., Châline N., Middleton H., Ratnieks F.L. (2002) Reassessing the role of the honeybee (Apis mellifera) Dufour's gland in egg marking. Naturwissenschaften 89:528–532. Katzav-Gozansky T., Soroker V., Hefetz A. (2002) Honeybees Dufour’s gland—idiosyncrasy of a new queen signal. Apidologie. 33:525-537. Oldroyd B.P., Ratnieks F.L.W. (2000) Evolution of worker sterility in honey-bees (Apis mellifera): how anarchistic workers evade policing by laying eggs that have low removal rates. Behavioral Ecology and Sociobiology 47:268–273. Katzav-Gozansky T., Soroker V., Hefetz A. (2002) Evolution of worker sterility in honey bees: egg-laying workers express queen-like secretion in Dufour's gland. Behavioral Ecology and Sociobiology 51:588–589. Gunnison A.F., Morse R.A. (1968) Source of the Ether-Solvible Organics of Stings of the Honey Bee, Apis mellifera (Hymenoptera: Apidae). Annals of the Entomological Society of America 61:5–8. van Marle J., Piek T. (1986) Morphology of the venom apparatus. in: Piek T. (Ed. ), Venoms of the Hymenoptera: biochemical, pharmacological, and behavioural aspects. Academic Press, London, pp. 17–44. Mitra A. 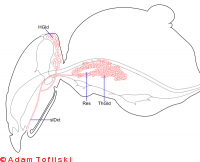 (2013) Function of the Dufour’s gland in solitary and social Hymenoptera. Journal of Hymenoptera Research 35:33–58. Abdalla F.C., Cruz-Landim C. (2001) Changes in the morphology of the Dufour gland of Apis mellifera L. (Hymenoptera, Apidae) during the life stages of the female castes. Revista Brasileira de Entomologia 45:123–129. Abdalla F.C., Cruz-Landim C. (2001) Behavioral Responses Evoked in Honey Bee Workers by Dufour Gland Extracts(Hymenoptera: Apidae). Sociobiology 37:673–678. Abdalla F.C., Gracioli L.F., Cruz-Landim C., Moraes R. (2001) Effect of topical application of juvenile hormone (JH) in honeybee worker larvae on the development of Dufour's and Koschewnikow's glands. Sociobiology 37:185–191.